of way under California Law? How Does California Law Define the Right of Way? The practical definition of this term as used in the various vehicle code sections where it applies is as follows: “When the law requires a [driver/pedestrian] to “yield the right-of-way” to [another/a] [vehicle/pedestrian], this means that the [driver/pedestrian] must let the [other] [vehicle/pedestrian] go first.” However, the caveat to this is the following: “Even if someone has the right-of-way, that person must use reasonable care to avoid an accident.” California Civil Jury Instruction 701. California Vehicle Code 21800: This is the principle law that applies to the conduct of drivers in and around “uncontrolled” intersections (i.e. no traffic lights, stop or yield signs) in CA. It mandates yielding the right of way in the following circumstances: (a) vehicles approaching an intersection must yield to vehicles who have already entered the intersection from a different highway; (b) when two vehicles approach the intersection at the same time from different directions, the driver on the left should yield to the driver on the right unless it is a “terminating highway” (road that dead ends into another), in which case, the driver on the terminating highway must yield to the motor vehicle operator on the continuing highway. (c) if the intersection is controlled by stop signs in all directions or in the case of an intersection with inoperable traffic lights, the car on the left should yield to the driver on the immediate right. California Vehicle Code 21801: (a) a driver who is intending to either turn left or make a legal u-turn must yield to all traffic traveling in the opposite direction and not initiate or continue the turn until such traffic is a safe enough distance away to negotiate the turn; in the alternative, subsection (b) states that if a driver making a left or u-turn has properly yielded, turned on their signal and started to turn, the approaching traffic must yield the right of way to the turning vehicle. California Vehicle Code 21802: Requirement to come to a complete stop when approaching a stop sign and yield to all vehicles at an intersection controlled by stop signs until it is safe to proceed. 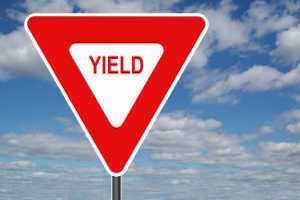 California Vehicle Code 2180: Legal duty to yield at a yield sign and not proceed until traffic has passed a safe distance. California Vehicle Code 21804: “Entry Upon a Highway” (a) provision requires all cars about to enter a roadway from a side street, parking lot or alleyway to stop for traffic already on the roadway and not enter the road until safe to do so; but also in subsection (b) requires vehicles to yield to cars who have lawfully entered the roadway and allow them safe passage onto the roadway. California Vehicle Code 21805: Requires yielding for horses at officially designated equestrian crossings. California Vehicle Code 21806: Mandates yielding to emergency vehicles like police cars or ambulances with sirens going and at least one emergency light lit for a distance of 1000 feet from the front of the approaching vehicle and to pull to the right hand curb and allow such vehicles to pass. (NOTE: CVC 21807 states that this provision does not relieve drivers of emergency vehicles to use reasonable and due caution in the operation of their vehicles). California Vehicle Code 21950: Duty to yield to a pedestrian crossing a roadway either “lawfully within a crosswalk or within any unmarked crosswalk at an intersection”. The bottom line is that the “right of way” provides for order on our California roadways. This is especially true in the congested streets of urban areas like Los Angeles, San Diego, Orange County and the Inland Empire. Failure to obey the rules of the road with respect to stops and yields in these circumstances can lead to serious traffic collisions. As you can see from the various provisions of the laws of the State of California, the “right of way” issue is one that comes up quite often and for each requirement to yield in one instance, there are equal and opposite requirements to allow drivers to proceed in others. For example, ever driver should yield before making a left but, if the person hanging the left made a reasonable right of way yield before turning, approaching traffic then can’t speed up, run a red light or otherwise not allow that driver to pass safely. These instances then become subject to dueling legal arguments as to fault which are best addressed by retaining legal counsel familiar with CA law and who is able to review the police accident report or obtain other evidence such as witness statements that can support an allegation of negligence and provide a means for collection of damages for medical costs, lost wages and emotional distress.